At our Facebook listing, there’s now a “Free Gift” option you can click on. It is located in the left hand column. Look for the grey box with a white “star” in it that says “Free Gift” and you’ll find it is waiting for you. The “Free Gift” is available to anyone who has chosen to press the “LIKE” button for the Sensory Nutrition page on Facebook. The current “Free Gift” selection is a special guide that will download as “Fat Substitutions For Holiday Baking” which we have prepared just for you. Obviously, it ties into our Holiday Baking theme this month. You’ll find that we may suggest alternative, healthier profile fats to substitute for some of the fats you are using now in recipes, or we may suggest trying a little bit of some lower-fat or possibly non-fat alternatives for some of the higher fat products you are currently using in recipes where that type of substitution MIGHT work. The guide covers more than just cookies–it covers all kinds of baked goods. The guide is pretty comprehensive and suggests possibilities for you to consider, but as always, we leave the decision making up to you. Some baking recipes lend themselves to “tweaking” more than others do and sometimes it can take more than one try to adjust a recipe to be satisfactory from your sensory perception perspective. 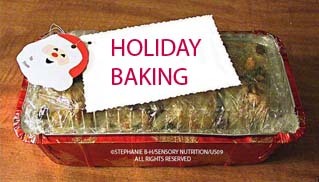 Please also refer back to our post of December 6, 2011 in which we discussed “Holiday Baking – Keep Some Flavor, Skip Some Fat” where we broached some ideas to consider when it comes to using Fat Substitutes in baking. When you stop by our Facebook page and pick up your “Free Gift” in pdf form for our fans who take the time to “LIKE” our page and our blog site, know that it is our way of saying Thank You for your support of our mission here at the Sensory Nutrition blog site. We hope your holiday activities are going well and that you are enjoying all the season has to offer on so many levels in your life.